Seems a stable is handling more than just horses, and a betting syndicate is handling more than just numbers. Between them they run an assassination service wherein horse jockeys use special binoculars with built-in poison-dart guns to silently dispatch the desired target in public. 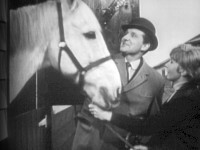 Steed arrives from the foreign office to keep an eye on a dignitary's prized horse, while Cathy becomes a bookie's assistant. A good solid episode all around, with a couple of nice twists. Only loses points for being a bit bland—no standout performances and no sense of urgency to the progression of the plot. Strange that Steed, who is later portrayed as something of a horse expert (see "Silent Dust" for example), should be ignorant of the fact that the "fine" steed he was protecting—which is ultimately offered to him as a gift—is actually a senior citizen. 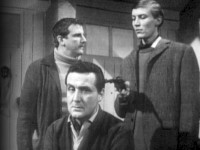 According to Television's Greatest Hits, this was the top-rated episode for this year, and ranked third of all Avengers episodes according to viewer ratings at the time it aired. See what the other top-rated episodes were. This episode premiered on my ninth birthday. Now, that's trivial! Cathy's prospective employer is blown away (as are we) by her mind-boggling mental capacity as she rattles off an almost too-long string of complex calculations. 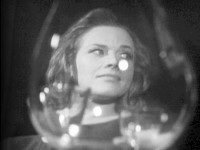 Cathy quizzes Steed at the racetrack: "What did you really want me down here for?—I'm a bit rusty on my tic-tac."